It’s down to the one last encounter between South Africa and Pakistan in the ODI series. The series is squared up at 2-2 and the Newlands, Cape Town will host the series finale. Going by the competitiveness in the previous 4 games, the last one is going to be a cracker. Keep reading to find out South Africa vs Pakistan 5th ODI Match Prediction. After a disappointing Test series, Pakistan made a good comeback by winning the first ODI. But the hosts crept up to win the next two. Once again, the visitors raised their game and came back to win the 4th ODI. In the last game, it was as clinical as a performance can get. The Pakistani bowlers, especially Usman Khan, were brilliant. They bowled South Africa out for just 164 where Usman took 4 wickets. Then, the top 3 batsmen contributed and chased the score down with 8 wickets to spare. Pakistan has been the more dominant side in the series and momentum lies with the Men in Green. 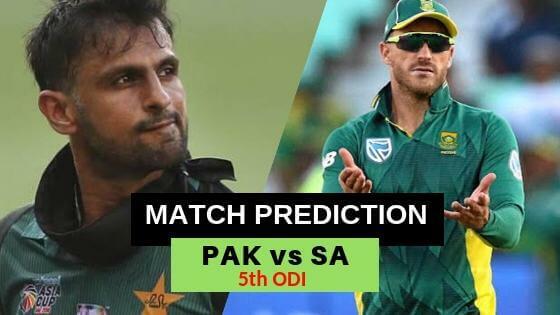 South Africa vs Pakistan 5th ODI Match Prediction: Even though the scoreline of the series is 2-2 currently, Pakistan has been the better side so far. Going into the last game, they have the momentum which makes them favorites to clinch the series.